These days, it is easy to find information about any location in the world by typing in the place name on one’s personal computer from the comfort of home. The digital search results can even include high-resolution images of the desired site and its immediate vicinity. However, delving into the past of a place is not as easy, and for this activity the printed book can convey not only information but context. The History and Antiquities of Every Town in Massachusetts is a historical travelogue of Massachusetts for the modern researcher. 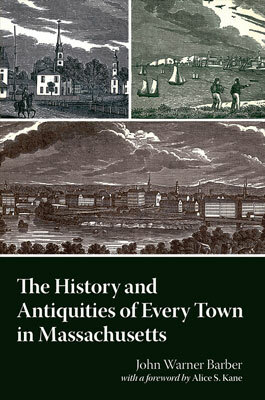 Its author, engraver and historian John Warner Barber, gives his historical perspective of the towns and cities of Massachusetts from their respective beginnings up until the time of the volume’s publication in 1839. Modern biographical sketches of John Warner Barber say that he is known best for his books on local, state, and national history, and the Columbia Electronic Encyclopedia notes that “his engravings caught the flavor and appearance of city, town, and countryside in his day.” In this fourth compiled history – he has similar volumes for Connecticut, New Jersey, New York, and other locales – Mr. Barber arranges his descriptions conveniently in alphabetical order, first by county name, then by town or city name. His facts and details of each town’s early settlement include original Native American place names as well as names of successive leaders of the principal religious institution founded there. Statistics about local industries and agriculture, descriptions of landmark architecture and cultural organizations, and brief biographical sketches of historic residents round out the picture of the place. The language of the descriptions, his choice of excerpted texts, and his illustrations communicate to the thoughtful reader the historical perceptions of Mr. Barber’s time. Since the publication of Barber’s work – originally called Historical Collections; Being a General Collection of Interesting Facts, Traditions, Biographical Sketches, Anecdotes, etc., Relating to the History and Antiquities of Every Town in Massachusetts with Geographical Description – Massachusetts has expanded from the 306 towns and cities described to 351, according to the 2010 census. In addition to this modern reckoning, Barber’s original number is reduced by four towns (Dana, Enfield, Greenwich, and Prescott) abolished in 1927 and drowned by the Quabbin Reservoir in 1938, and again by four towns (Brighton, Charlestown, Dorchester, and Roxbury) annexed into the City of Boston. The landscapes of Barber’s time have been expanded and altered by the introduction of the railroads and industrialization. In this volume is contained a snapshot of Massachusetts on the edge of that change, allowing readers to look backward to its historic origins from a nineteenth-century perspective. Adapted from the foreword to John Warner Barber’s The History and Antiquities of Every Town in Massachusetts. wow, my consultant is an author. How can I get an autographed copy. I assume I can do so through the bookstore?